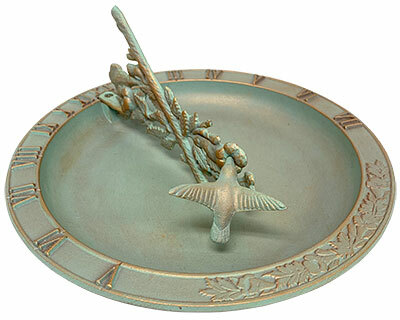 Celebrate a variety of birds in your yard with the Whitehall Aluminum Hummingbird Sundial Bird Bath. The classic design and dual function of this unit bring excitement to your bird garden with ease. A 1" wide band forms an exterior rim, housing raised Roman numerals which create a dial. This rim also provides perching for birds, and leads to the 1" deep bird bath. An intricate twig shape, full of leaves and trumpet flowers, rests slightly above the bath, and a hummingbird figure hovers over one of the blooms for added realism. This extended branch shape acts as a gnomon, its shadow denoting the time when the item is faced celestial north. The copper colored finish throughout the piece enhances your yard, and the verdigris hints bring dimension. The aluminum construction provides durability for several seasons of use. Place this combination unit on the ground for birds to rest and bathe, or mount it to a pedestal (not included) for added height and design. Bring your bird garden to new life using this Aluminum Hummingbird Sundial Bird Bath. Made in the USA. Whitehall Aluminum Roman Sundial Pedestal, Copper Verdi, 26"
Whitehall Aluminum Frog Sundial, Copper Verdi, 12" dia.